Mattia Gavazzi (Androni) marked his return to the peloton after a two-and-a-half-year suspension for testing positive for Cocaine with a sprint victory in the seventh and final stage of the 2013 Tour de San Luis. The 29-year-old Italian, who had won the opening stage in his previous appearance in the race in 2009, managed to out pace Slovakian champion Peter Sagan (Cannondale) at the end of the rolling 160km stage between San Luis and Juana Koslay. Francesco Ventoso (Movistar) was third. The stage, which was based on three circuits of a lumpy 49km loop was dominated by a large breakaway group that escaped in the early, uphill kilometres. Juan Ariel Lucero (San Luis-Somos Todos), Adrian Kurek (CCC Polsat-Polkowice), Tyler Wren (Jamis-Hagens Berman), Alfredo Gutiérrez (Buenos Aires Provincia), Julian Gaday (Buenos Aires Provincia), Carlos Betancur (AG2R La Mondiale), Enzo Moyano (Caja Rural) and Michal Kwiatkowski (Omega Pharma-Quick Step) managed to get away from the peloton, and open up a lead of more than three minutes. The group was then joined by Jesus Hernandez (Saxo-Tinkoff), Kenny De Haes (Lotto-Belisol) and Guido Palma (Jamis-Hagens Berman), taking its number up to 11 and, at the 59km point had stretched its advantage to 3’40”. This was to be its maximum lead, however, as it put Kwiatkowski into the virtual race lead, and the teams of the general classification leaders began to close it down. With 66km to go the group of eleven still led by 2’20”, but this was to fall quickly and the race was all together with 16km to go. With former World champion Mark Cavendish searching for his second victory in the colours of his new team, Omega Pharma-Quick Step took control of the peloton on the final run to the finish. The Manxman was well place in the final kilometre but, as he found himself baulked, decided that caution was the best course and pulled out of the sprint. 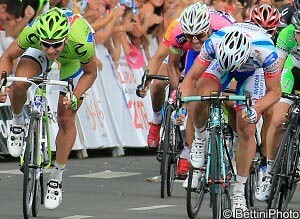 Gavazzi was the fastest of the sprinters, and took his first victory since the Brixia Tour in July 2009. Safely in the peloton, in 30th place, and having weathered the pressure from classification riders like Kwiatkowski in the breakaway, Daniel Diaz (San Luis Somos Todos) confirmed overall victory. The 23-year-old Argentinean, who finished second on stages six and seven, managed to improve on his overall second place of 2012, to finish 33 seconds clear of Tejay van Garderen (BMC Racing) to take the biggest victory of his career.